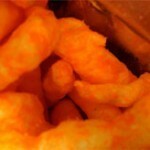 American kids know what Cheetos are, but giving the snack a close inspection is not as easy as you think. Why is some cheddar cheese orange? At this very moment, a child somewhere is eating cheddar cheese. It may be in her lunch box, on a sandwich, or accompanying a Triscuit. If you can picture this scene in your head, odds are that the cheddar cheese itself is orange.